Cleveland Browns interim coach Gregg Williams looks on during the second half against the Cincinnati Bengals at FirstEnergy Stadium in Cleveland, Ohio, on December 23, 2018. For once, the Browns can be picky. Their coaching vacancy is more attractive than it's been in the past. BEREA (AP) — The Browns believe they finally have the pieces. All that's missing is someone to keep them together. 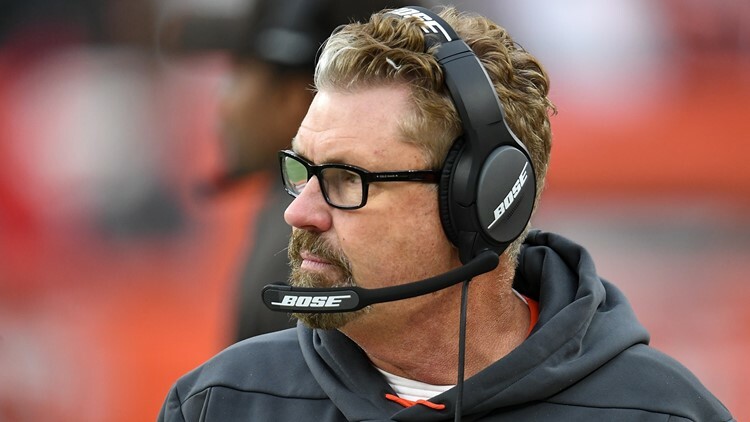 A day after Cleveland ended a promising turnaround season following a winless 2017, general manager John Dorsey said he will interview interim coach Gregg Williams and offensive coordinator Freddie Kitchens in his search for the Browns' ninth full-time coach since 1999. Dorsey's pursuit will start internally and quickly expand. "Why not go and look at everybody?" Dorsey said Monday. With cornerstone players like quarterback Baker Mayfield, Pro Bowl defensive end Myles Garrett and wide receiver Jarvis Landry in addition to highly touted rookies Nick Chubb and Denzel Ward, an abundance of salary-cap space, 11 draft picks in 2019 and deeply committed owners, Cleveland is a coveted job. The Browns have gone from appalling to appealing. "There is a bright future with this organization," Dorsey said. "Hopefully, they can see what we see here." Dorsey isn't disclosing which candidates he'll interview, but the team has requested permission to speak with Minnesota offensive coordinator Kevin Stefanski, New Orleans tight ends coach Dan Campbell, New England linebackers coach Brian Flores and two Indianapolis assistants in offensive coordinator Nick Sirianni and defensive coordinator Matt Eberflus, according to multiple reports. Former Packers coach Mike McCarthy is also expected to draw interest from the Browns. He and Dorsey worked together for seven years in Green Bay. "I have a lot of respect for Mike McCarthy and for what he's done," Dorsey said. Miami's firing of Adam Gase after three seasons could push him onto Dorsey's radar. Browns owner Jimmy Haslam has pursued Gase in the past as well as Patriots offensive coordinator Josh McDaniels. Dorsey has his list — and a checklist. "A guy who can instill leadership into these young men," he said. "A guy who is a collaborative thinker. A guy who is a continuous learner. A guy who is consistent on a day-in and day-out basis and who those players can look up to and go, 'You know what? I will follow that guy anywhere.'" Dorsey promised to provide updates once interviews are completed. Williams is up first. He'll meet Tuesday with Dorsey, who is impressed with the job the 60-year-old did in leading the Browns to a 5-3 record after replacing Hue Jackson in late October. The club's fiery defensive coordinator the past two seasons, Williams demanded accountability while keeping the Browns focused and fighting. "He's kind of got these guys believing," Dorsey said. "He's brought them in together as one. He's got them playing hard, that's all you can ask for." During his interviews, Dorsey said he wants to know how Williams — and others — see the Browns long-term. "I want to see his overarching vision and plan for this organization moving forward," he said. "I want to hear his thoughts on the team moving forward, but I also want to be able to explore multiple options out there in the National Football League and just see who fits." Beyond his accomplishments over the past two months, Williams has head coaching experience — and some baggage. He was Buffalo's coach from 2001-03, but he may be best remembered for his involvement in the New Orleans' "Bountygate" scandal. The NFL suspended Williams for the 2012 season. Dorsey wants a "man of character" to be Cleveland's next coach, and feels Williams has served any warranted punishment for previous sins. "I think he's paid his penalty for that," Dorsey said. Kitchens emerged as an improbable head coaching candidate after being promoted from running backs coach to coordinator when Todd Haley was fired the same day as Jackson. The affable Kitchens built a strong rapport with Mayfield, who set the NFL rookie record with 27 touchdown passes — 19 in the last eight games — and had Cleveland's offense playing at a high level. Even if he doesn't get the head-coaching gig, Kitchens, 44, could remain as coordinator. "He's very relatable," said guard Joel Bitonio. "We talk about Baker being a guy that everybody in the locker room relates to. Freddie's kind of that guy, too. He's been around the block even though he's not too old and he's a fun personality to be around. I think if he was put in that position (as head coach) the players would rally around him." The Browns could simply leave things as they are and bring back Williams and Kitchens in the same roles. However, center JC Tretter believes Dorsey and his staff won't be swayed by the team's second-half surge. "You have to kind of step back, and I think that's what the guys upstairs are going to do," Tretter said. "They're going to look for the best thing for the next five, 10 years." NOTES: DT Larry Ogunjobi revealed he played the final few games with a torn left biceps. He's not expected to need surgery. ... Mayfield was not available for comment. However, he did leave a signed jersey on the chair of left tackle Greg Robinson, who started the last eight games and revived his career in Cleveland.